1 Find A Grave, (accessed 09/18/2014). 2 Breck, Samuel, Genealogy of the Breck Family Descended from Edward of Dorchester and His Brothers in America, Omaha: Rees Printing Company (1889), 29, 34, Internet Archive (Digital Library). 3 Hampton, Vernon B., Staten Island's Claim to Fame: The Garden Spot of New York Harbor, Staten Island, New York: Richmond Borough Publishing and Printing Company (1925), 165-167, Heritage Quest (Digital Library). 4 Roberts, Gary Boyd, Notable Kin, Volume 1 , Santa Clarita, California: Carl Boyer, 3rd (1998), 220. 5 Sturgis, Francis Shaw, The Descendants of Nath'l Russell Sturgis: With a Brief Introductory Sketch of His Ancestors in England and . . ., Boston: Printed by G. H. Ellis (1925), 1, 5, Heritage Quest (Digital Library). 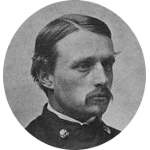 6 Wikipedia, "Robert Gould Shaw", (accessed 09/18/2014).